I created an 18 minute video on 800 meter training, with an slight emphasis for 400 meters moving up in distance. Scroll below for the video, or click here for the video on YouTube. Here is the presentation in PowerPoint with the transcript of the 12 slides on AuthorStream. You can also download the PPT or Video file (MP4 version) or get the transcripts from that link as well. Below is the executive summary, with references to the charts and diagrams. mental toughness… at 500m they are all going to start kicking for home. Are you ready for it? 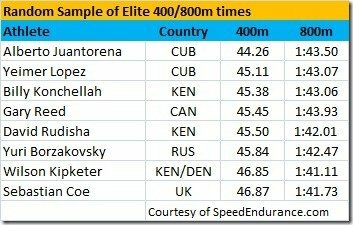 It’s interesting that the men in 1:41 range “only” had 46 second 400m speed! 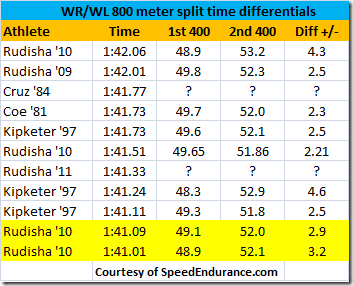 The golden secret to 800 meter success? It’s all about speed reserve! 800 meter training requires optimal balance of Anaerobic/Aerobic training… more than any race distance! 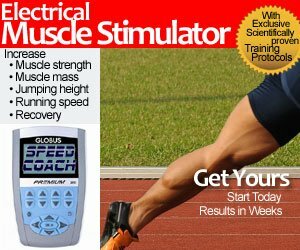 circuit training or other training (Pilates, yoga, speedbag, etc). 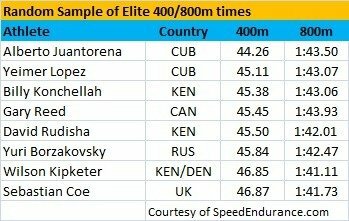 So a sample training week for a 800m would be something like this assuming hard sessions in the AM for weather reasons. Some 800 meter runners like the recovery run in the AM to allow more time before the afternoon track workout. Was Arthur Lydiard Right All Along? I don’t understand your weekly schedule. Why would you put strength training on Monday, Wed and Friday, and then have track intervals (I’m assuming some of these are considered harder breakdown work) on the off days. Especially the Tuesday workout which you are calling a speed session. Strength training and speed sessions should always be on the same day to get all the breakdown occurring and then all the recovery on the other days. Even better, would be to have 2 recovery days between hard breakdowns. It is not a matter of just fitting everything into the week, but in maximizing the body’s ability to breakdown and then recover.